Götzenite: Mineral information, data and localities. Very pale yellow, tan, off-white, colorless, white. 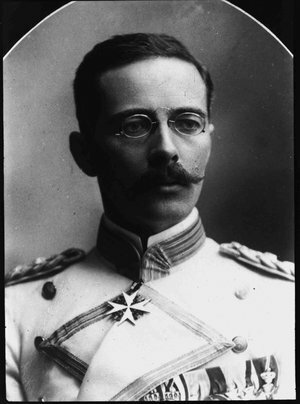 Named for Gustav Adolf von Götzen (1866-1910), German traveler who was the first European to climb Mt. Shaheru, North Kivu, Zaire (in 1894, together with a German companion), the Type Locality for the species. 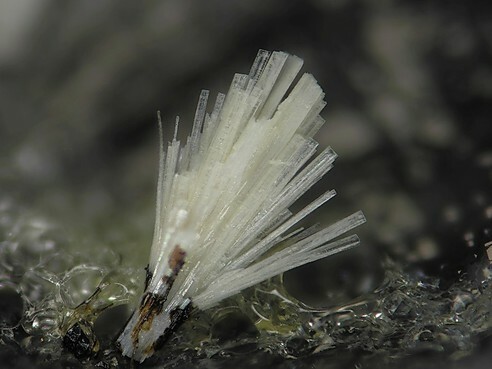 This page provides mineralogical data about Götzenite. 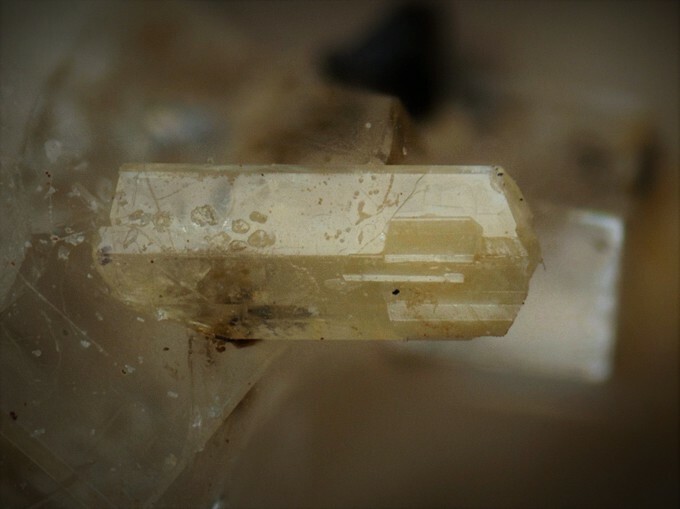 As prismatic crystals up to 0,5 mm long. Fluorite 8 photos of Götzenite associated with Fluorite on mindat.org. Aegirine 4 photos of Götzenite associated with Aegirine on mindat.org. Calcite 3 photos of Götzenite associated with Calcite on mindat.org. Gonnardite 2 photos of Götzenite associated with Gonnardite on mindat.org. Nepheline 2 photos of Götzenite associated with Nepheline on mindat.org. Pectolite 1 photo of Götzenite associated with Pectolite on mindat.org. Andradite 1 photo of Götzenite associated with Andradite on mindat.org. Ancylite Group 1 photo of Götzenite associated with Ancylite Group on mindat.org. Eudialyte 1 photo of Götzenite associated with Eudialyte on mindat.org. Astrophyllite 1 photo of Götzenite associated with Astrophyllite on mindat.org. Andersen, T., Elburg, M. A., & Erambert, M. (2014). Extreme peralkalinity in delhayelite-and andremeyerite-bearing nephelinite from Nyiragongo volcano, East African Rift. Lithos, 206, 164-178. Sahama, T. G. & Hytönen, K. (1957) Götzenite and combeite, two new silicates from the Belgian Congo. Mineralogical Magazine 31: 503-510; NJMM (2000), 496; Mineralogical Magazine 1957 31 : 698-699. Rastsvetaeva, R.K., Aksenov, S.M., Chukanov, N.V., Lykova, I.S., Verin, I.A. 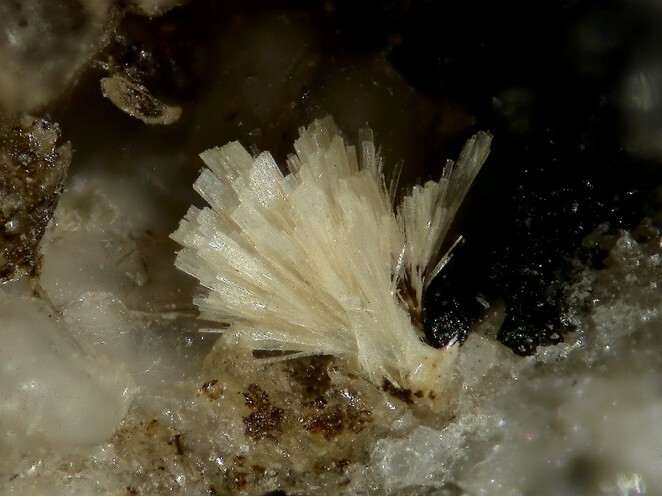 (2014): Iron-rich schüllerite from Kahlenberg (Eifel, Germany): Crystal structure and relation to lamprophyllite-group minerals. Crystallography Reports, Vol. 59, pp. 867-873. Blaß, G. & Schüller, W. (2012): Der Rother Kopf in der Vulkaneifel. Lapis, 37 (3), 20-29.; Aksenov, S. M., Rastsvetaeva, R. K., & Chukanov, N. V. (2014). The crystal structure of emmerichite Ва 2Na 3Fe 3+ Ti 2 (Si 2O 7) 2O 2F 2, a new lamprophyllite-group mineral. Zeitschrift für Kristallographie–Crystalline Materials, 229(1), 1-7. Chukanov, N. V., Zubkova, N. V., Pekov, I. V., Belakovskiy, D. I., Schüller, W., Ternes, B., ... & Pushcharovsky, D. Y. (2013). Hillesheimite,(K, Ca,□) 2 (Mg, Fe, Ca,□) 2 [(Si, Al) 13O23 (OH) 6](OH)· 8H2O, a new phyllosilicate mineral of the Günterblassite group. Geology of Ore Deposits, 55(7), 549-557. Stoppa, F., Sharygin, V.V., and Cundari, A. (1997): Mineralogy and Petrology 61, 27-45.; F. Stoppa and Y. Liu, Eur. J. Mineral. , 1995, 7, pp. 391-402; Bellezza, M., Merlino, S. and Perchiazzi, N. (2004): Chemical and structural study of the Zr,Ti-disilicates in the venanzite from Pian di Celle, Umbria, Italy. Eur. J. Mineral. 16, 957-969.; Stoppa, F., & Schiazza, M. (2014). Extreme chemical conditions of crystallisation of Umbrian Melilitolites and wealth of rare, late stage/hydrothermal minerals. Central European Journal of Geosciences, 6(4), 549-564.